It's almost absurd. In a plain tent they stand, not locked away but tangible, approachable and yet invaluably precious. Porsche 935 next to 911 2.0 R prototype. Berlin-Rome car type 64 next to 550A Le Mans Coupé. Porsche 908 long tail next to 962, 919 and RS Spyder. In between, the No.1 Roadster, 959 and 911 GT1. There is not only one Porsche 917, but a 917 KH, a 917/10 and a 917/30 Spyder; all sat next to each other as if taken for granted. In addition are their drivers Richard Attwood and George Follmer, in conversation with their designers Hans Mezger and Valentin Schäffer. A few moments later, the 917 KH throws itself into the corkscrew with such passion that its fibreglass-reinforced body scratches gently on the asphalt and the left front tyre begs for mercy. But it's not 1971. It's 2018. And it's Rennsport Reunion. A wonderful celebration. An insane celebration. Upwards of 60,000 spectators, most of them traveling in their own Porsche cars, are here alongside 350 race-participating vehicles and more than 50 driver legends – from the first Le Mans winners from 1970 to the latest victors from 2018. The meticulous collector with a unique piece restored to concours condition, next to a hot-rodder, which crossed its 356 with the drive train of a Porsche 911 Carrera 4. They are all eagerly awaiting the start of Rennsport Reunion VI. No event is bigger, no event is more familiar. Nobody wants to miss it. 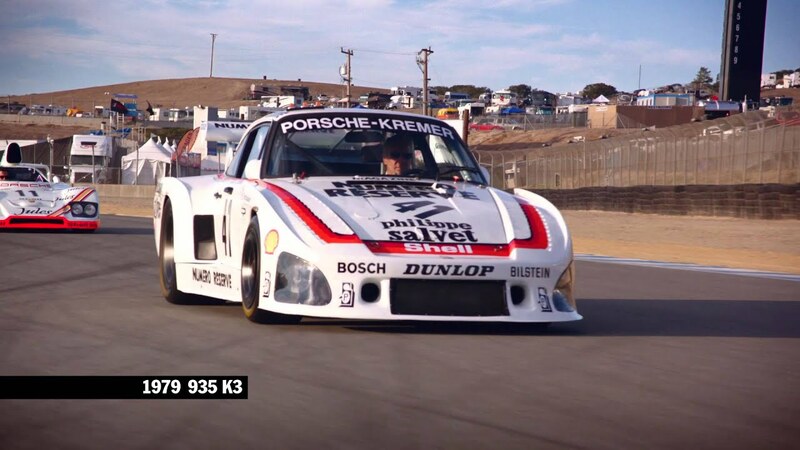 Because who would want to miss something like the new Porsche 935? This is a car that couldn't have been better presented anywhere else. A car by truly passionate people for truly passionate people. A car from Porsche for Porsche fans. A car that couldn't better characterise the spirit of this event. 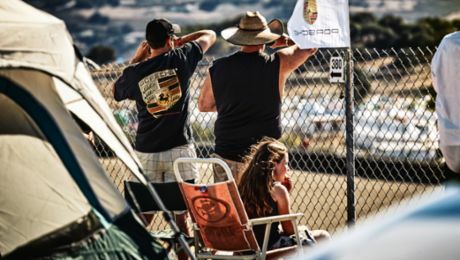 Because you don't have to explain turbo fans and megaphones to anyone at Rennsport Reunion. Not here, where the beer is called Guards Red Ale and the streets of the paddock are named after paint-to-sample colours. Everyone is a fan, everyone is a friend. Because above all Rennsport Reunion is a reunion.